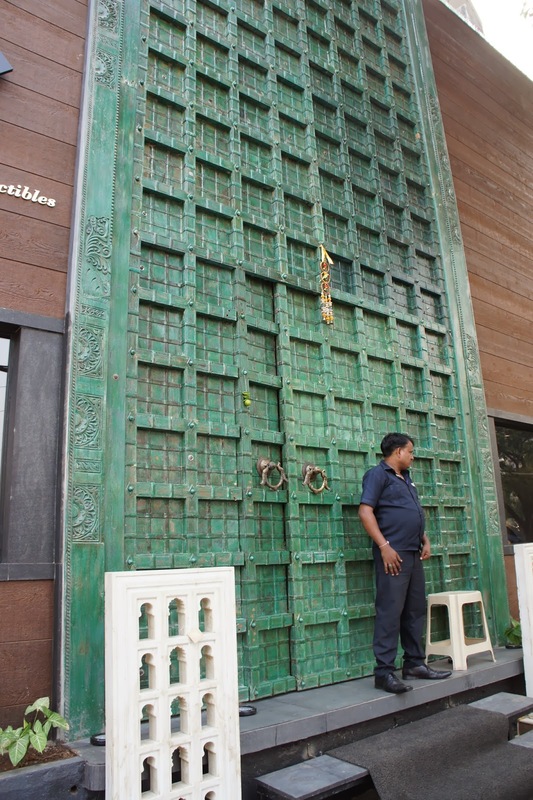 Some very large green doors have appeared on Dr Ambedkar Road (next to Pizza Metro). And when I say big, I mean BIG! Passing by yesterday and seeing that the sign to the left of the doors said 'Heritage, Jewels, Collectibles'...I was inevitably drawn in. Before entering the store, you know something special must lie behind that spectacular entrance. And sure enough - I was not to be disappointed. 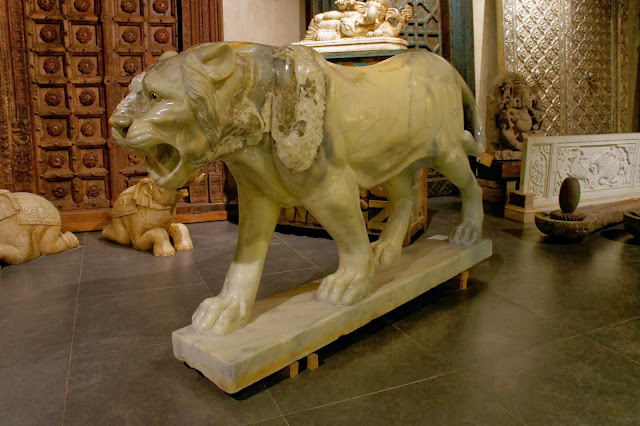 As you go through, you are immediately greeted by a giant marble lion to the left - and to the right: an incredible display of sparkly jewellery. 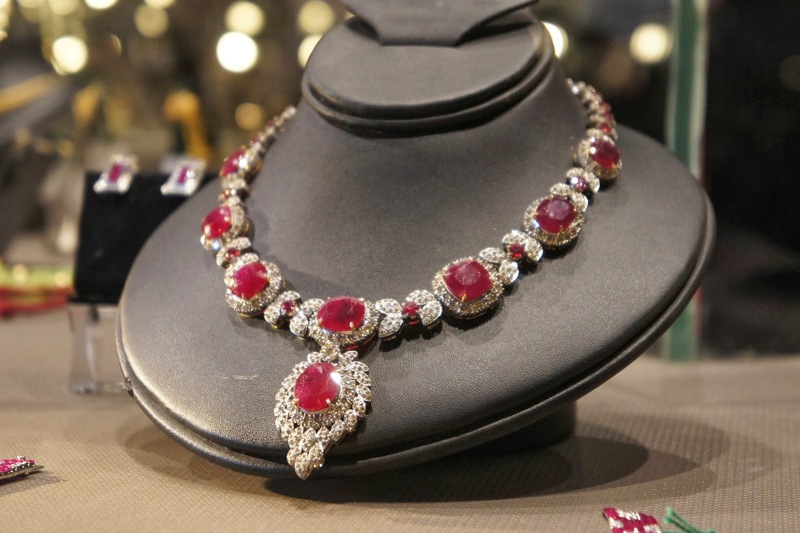 Of course, being a woman, I was attracted to the gleaming jewels like a magnetised magpie. Wow! you've never seen anything like it! Gold chokers encrusted with cut and uncut diamonds, emeralds, rubies and tourmalines; diamond bracelets, bejewelled pendants, rings and ear-rings. 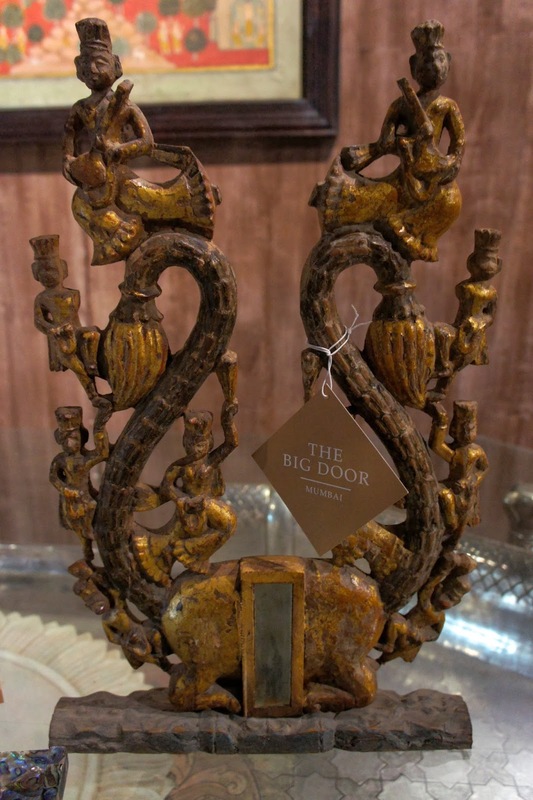 But not the usual stuff of Indian wedding dreams that you see on Waterfield Road - this is pure, handcrafted artistry from Jaipur, some heavy set and some fine, but each piece with an attention to detail that demands closer inspection. 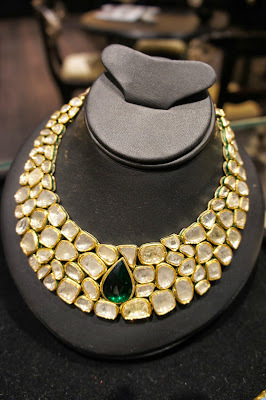 This piece blew me away - uncut diamonds and a huge emerald. 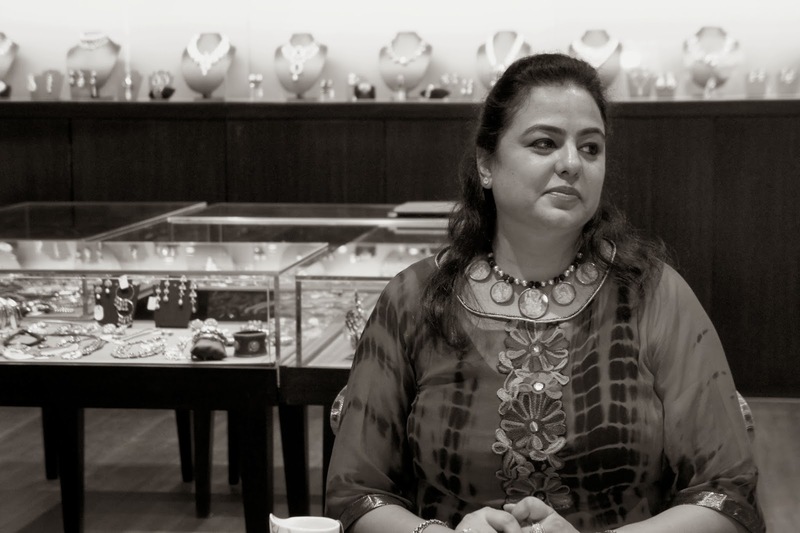 I am soon introduced to Sunita Gupta who is one half of the brains behind the store. The other half is her husband Vivek - as yet unseen. Sunita - highly sophisticated in a beautifully embroidered, floaty red kurta tells me that she designed all the jewellery in conjunction with her brother Ravi Ajmera (of Ravi Jewels). 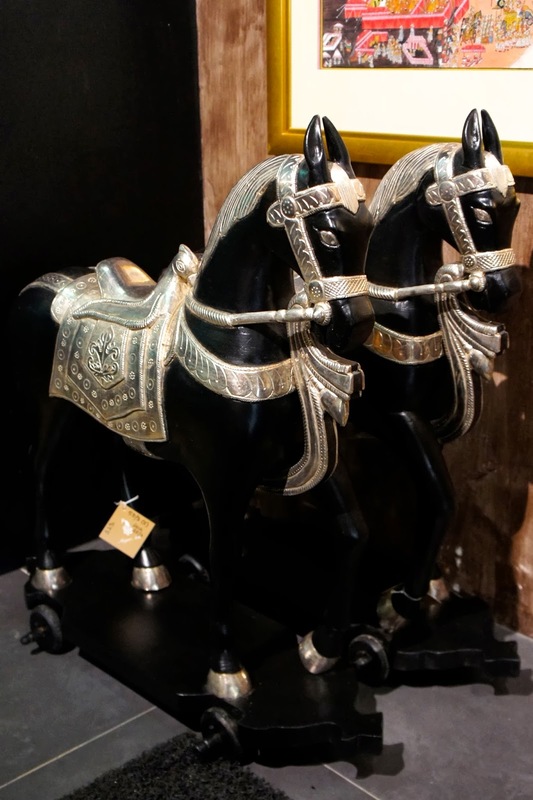 Their designs are executed by a team of master craftsmen in Jaipur. You can not help but be awe-struck by the contents of the display cabinets. Sunita also tells me that any piece can be created or adjusted to the client's requirements. 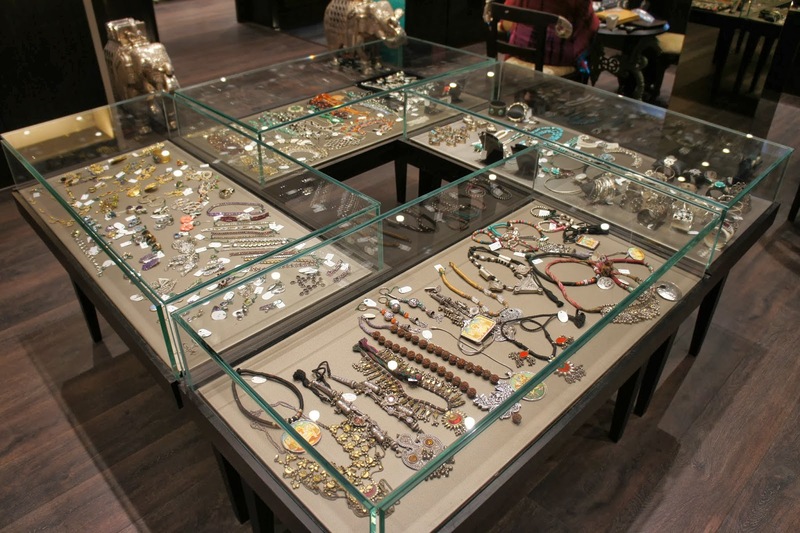 As well as the high-end collection, there is a smaller display of what I'd call 'accessible' jewellery (phew!) 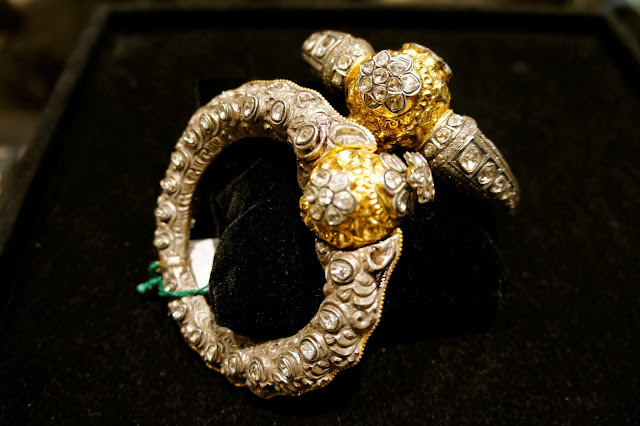 - mostly in silver but still set with fine stones (price range 5,000-40,000 Rs). I am already wondering what Mr Jules can get me for Christmas. After spending quite some time fawning over the jewellery, I am dying to know what is secreted up those stairs. Vivek Gupta arrives to show me the next level and takes the opportunity to explain some of the thought processes behind the store's creation. Only a few weeks old, The Big Door's expansive interior took eight months to design, build and perfect. 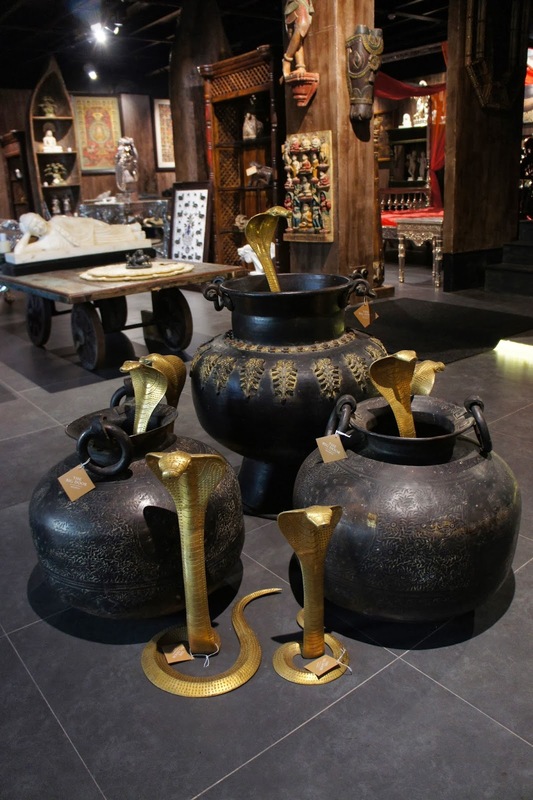 It looks more like a museum than a store. 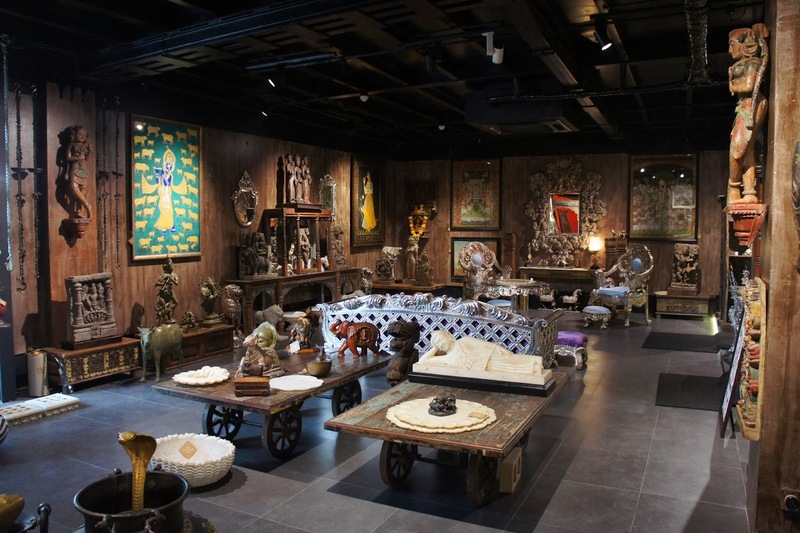 Vivek tells me that this is exactly the thinking: that this should be a superior space where traditional crafts and artefacts - mostly from Rajasthan - can be properly showcased. Before you even look at the products themselves, you can see that every attention to detail has been applied to the interior - from the mirrored jali ceilings to the wood-panelled walls to the atmospheric lighting. A place to relax whilst you browse. Vivek and I discuss how we find it incredible that some people choose to buy copies of Indian crafts imported cheaply from China, or those who have their houses fitted out with the latest Italian designs (also copies), when his country produces such a massive wealth of incredible handmade furniture and textiles. I am impressed by his passion and agree that showcasing these artefacts sensitively is what Mumbai needs. 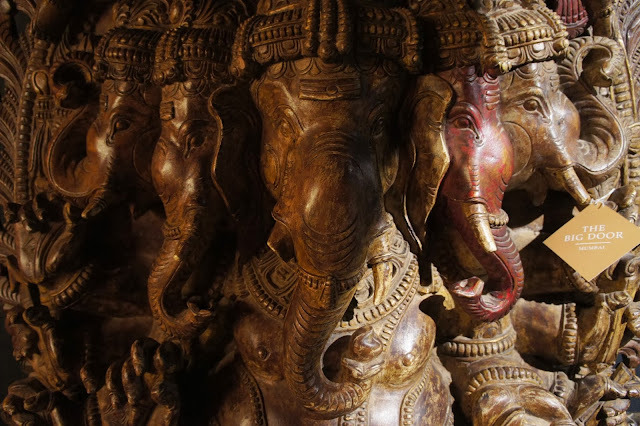 I hate those 'Cottage Industry' emporiums that churn out wooden elephants, sandalwood incense sticks and overpriced pashminas to the masses. You certainly will not find any pashminas here - or cushion covers. 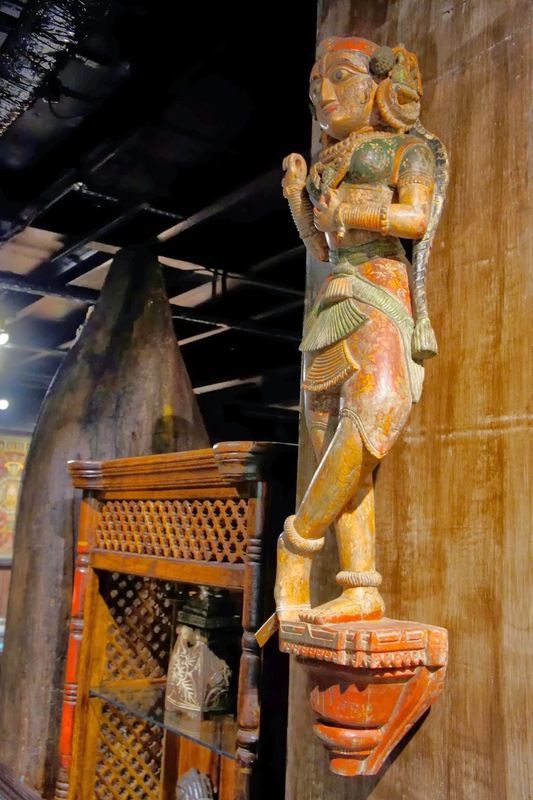 Upstairs, the focus is on solid marble, silver or wood accessories; giant pieces of furniture; antiques and paintings. 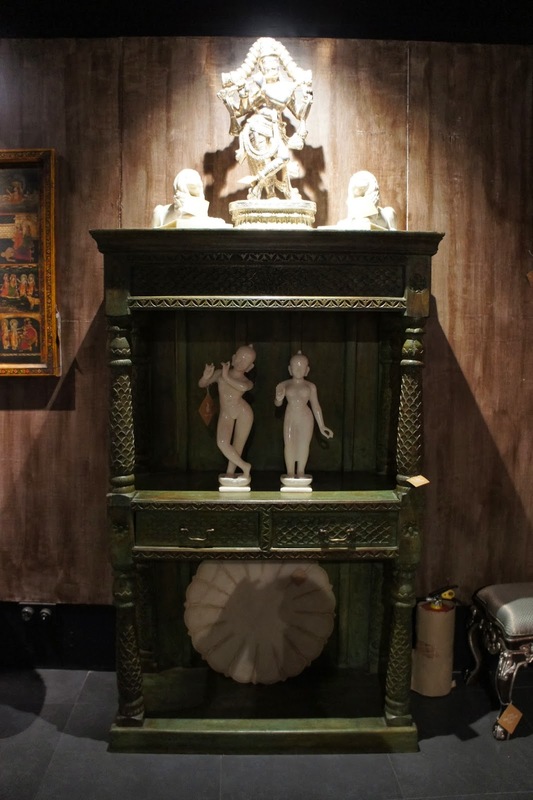 The collection is eclectic yet binds beautifully together in this fantastic, subtly lit space. A lot of the pieces are in fact recent, faithful reproductions utilising traditional skills - but in amongst the items on display, you will also find the odd two hundred year old artefact. Which makes the hunt even more exciting. I am shown into the bathroom, where there is a gorgeous round copper sink on display and a shallow cupboard that has been converted into a long mirror. Everything but the toilet is for sale. This piece of furniture is priced at 36,000 Rs - surprisingly reasonable! And what surprised me the most is the pricing! To be honest, I was a bit embarrassed to ask the prices at first, but I needn't have been. The pieces are labelled but the fixed price is in code - just ask how it works and you won't have to ask again. 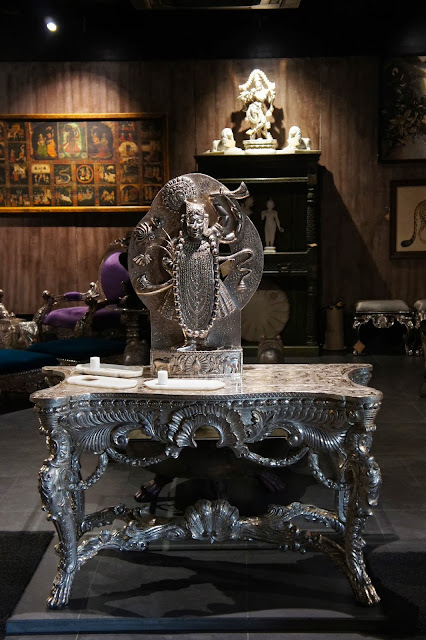 A large green painted sidepiece is priced at only 36,000 Rs (£360/$550); the bone inlaid dressing table is 46,000 (£460/$700); the shiny metal birds are only 3,750 Rs (£38/$57); and a gorgeous mother-of-pearl tray is 5,500 Rs upwards (£55/$83). 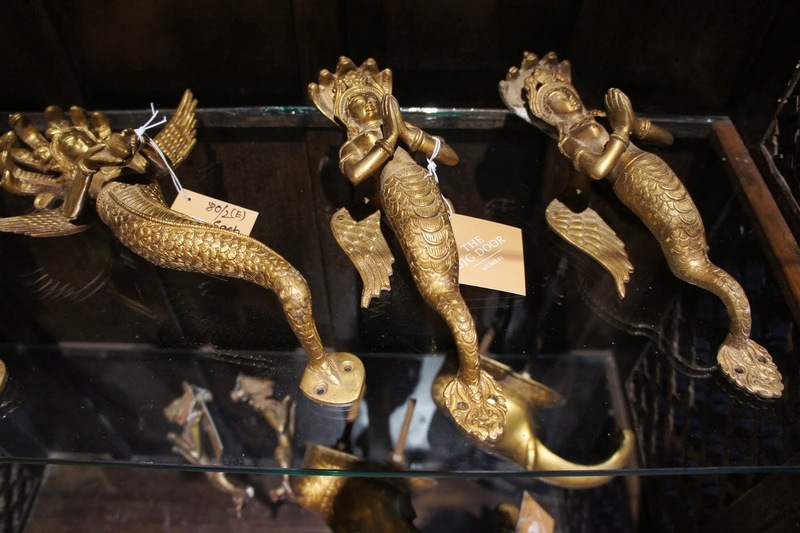 I am pleased that the pricing is accessible and that there is something for everyone - whether it be big or small. 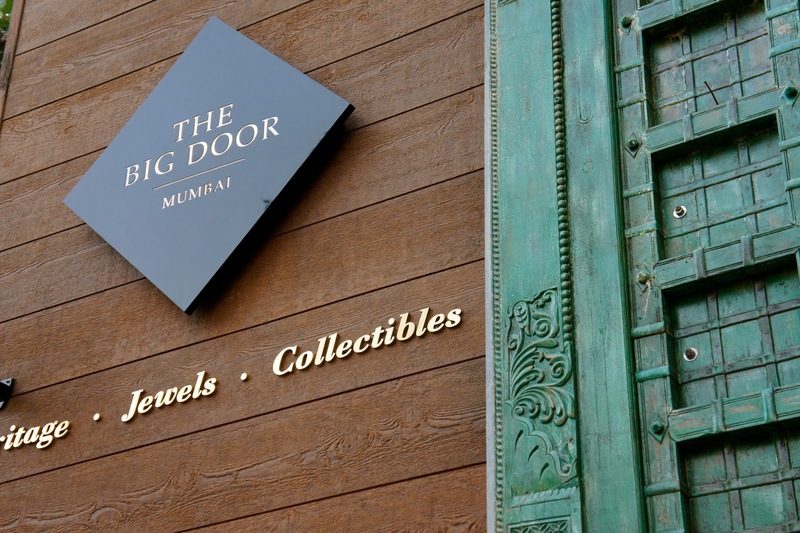 Some of these items will definitely be recommended in my Mumbai Christmas Shopping Guide 2013! 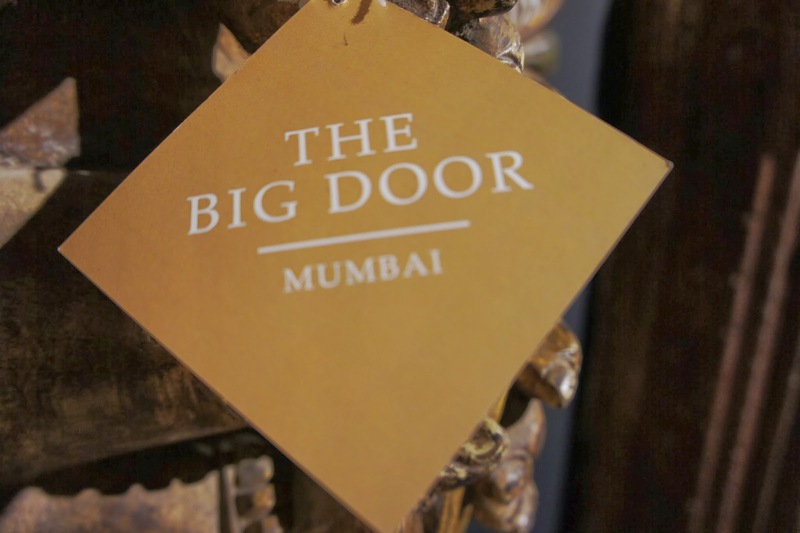 The Big Door is a family run business - with wife Sunita running the jewellery side and Vivek taking care of the rest. Other members of the family produce and supply the products from Jaipur. I meet another family member Arpit Mantri who is handling the marketing and PR. He tells me the store is already being featured in Elle Decor and they have had a lot of interested from people walking past and being attracted through those Big Doors. A bit like me then! Here are the images - I have especially taken photos of some of the smaller items that would make lovely gifts. 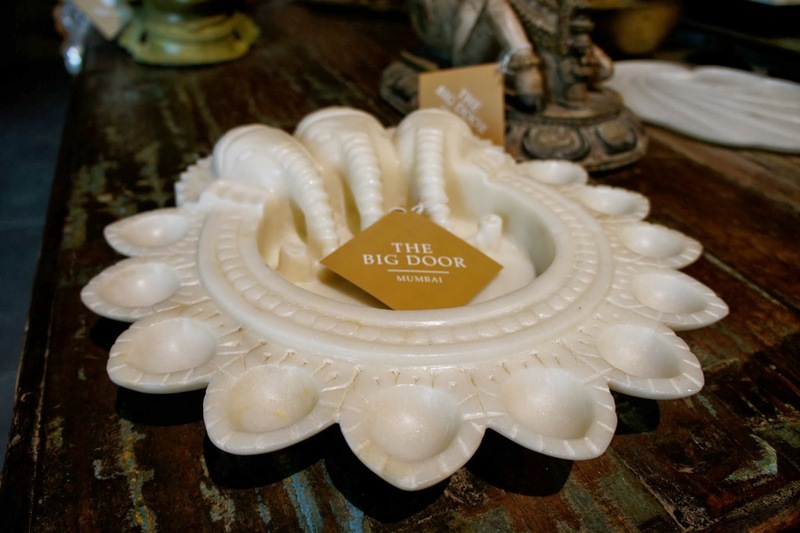 I love this marble diya with elephant detailing - 28,000 Rs for a pair. 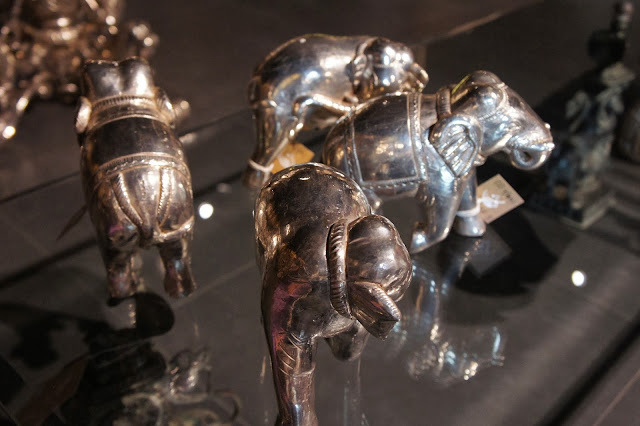 Gorgeous silver elephants parading on a coffee table. 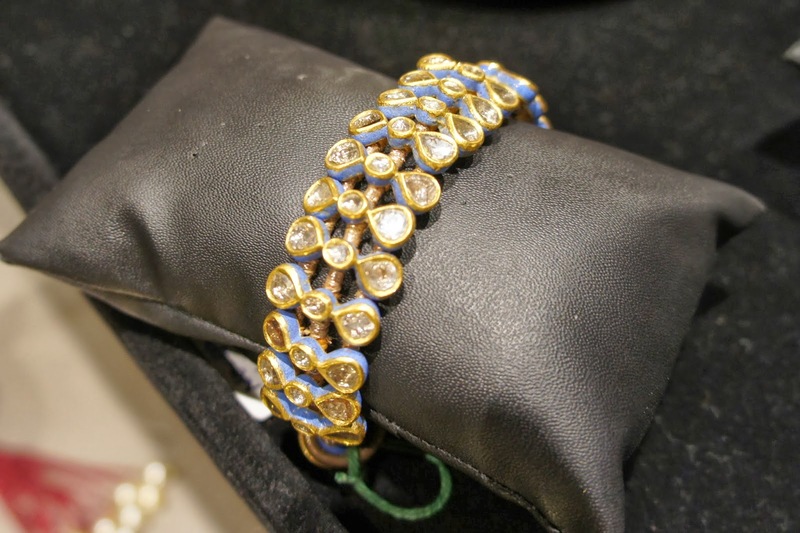 suitable for any Bollywood star (or David & Victoria Beckham!). Look closely at the detailing - fantastic. You will find these wonderful teak pillars that have been converted into huge candlesticks. 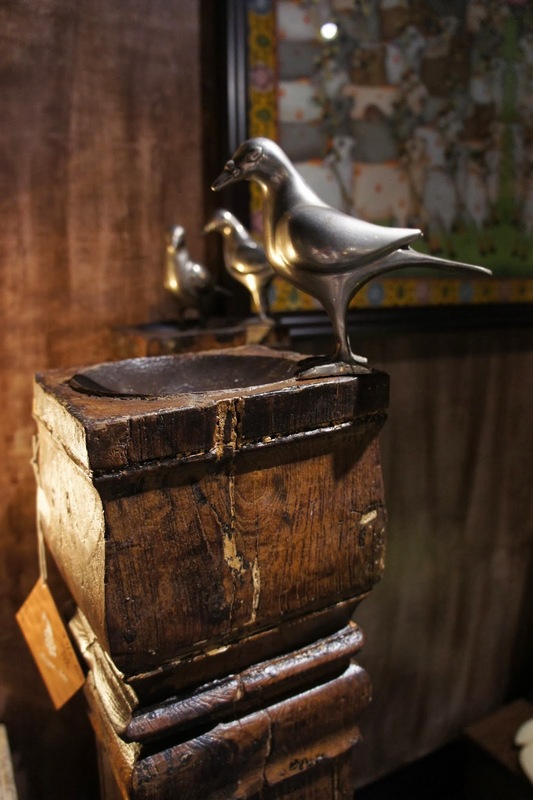 A metal bird (3,750 Rs) perches on this one. This artefact is over 200 years old. 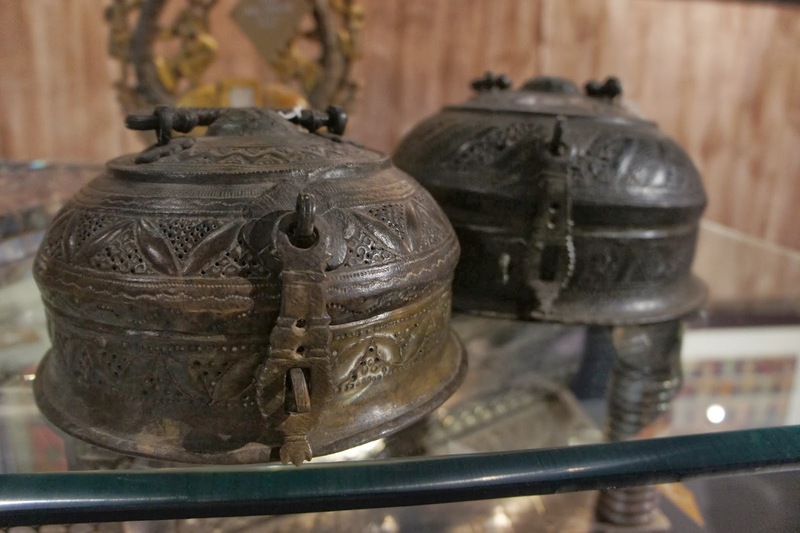 These old roti tins can be used as jewellery boxes. The metal work is beautiful. 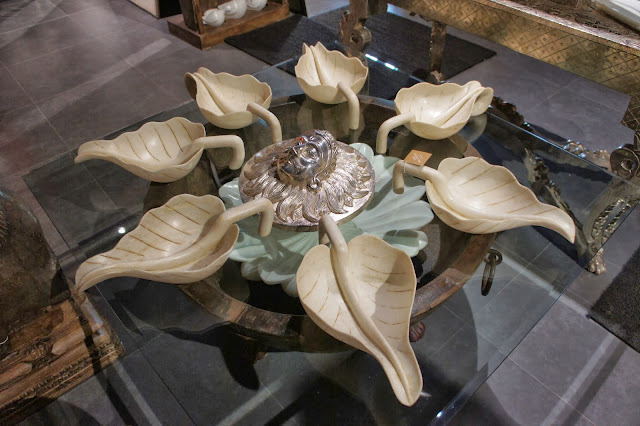 Each of these amazing lily pads are carved out of a single piece of marble. Incredible! Price 25,000 Rs each. One of a pair of antique wall ornaments - 2.75 lakhs. 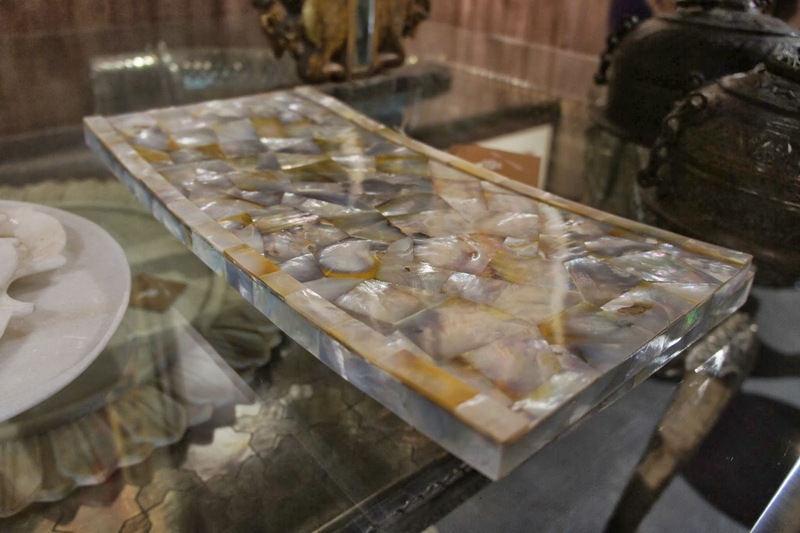 Mother of pearl trays available for 5,500 Rs upwards. My photo doesn't really do this justice. 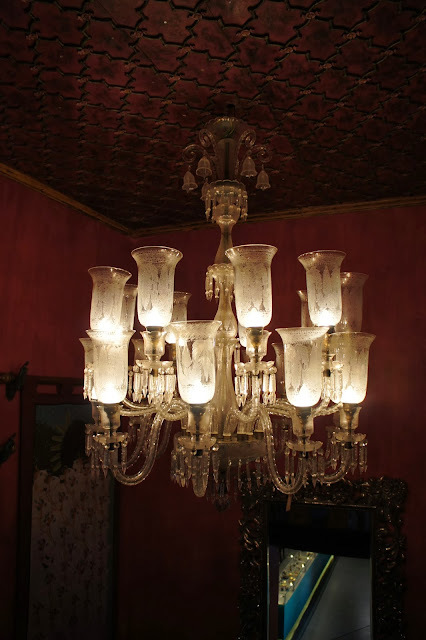 This Italianate style chandelier is of course, hand crafted in Jaipur. Check out that wooden Jali ceiling. 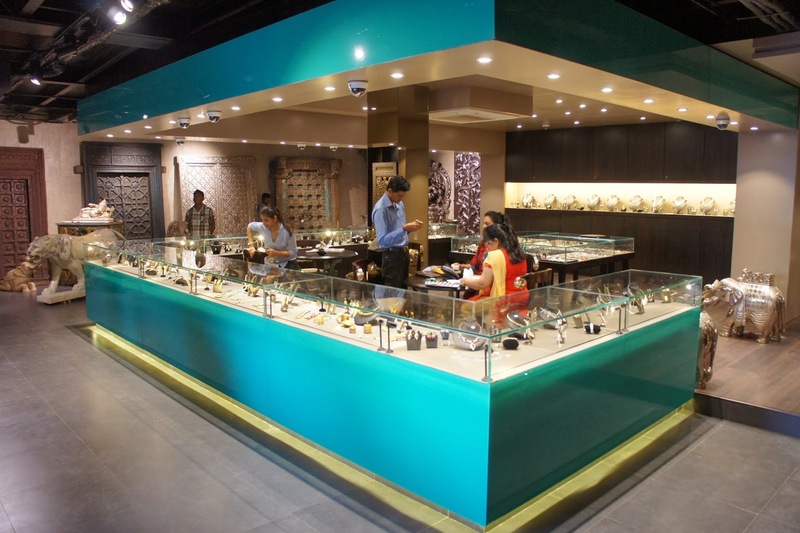 The jewel area on the ground floor. Approach only if you dare! OK, you can start breathing now! ...and this unusual diamond encrusted bangle. Boys...start getting your chequebooks out! As you come in you will see a selection of architectural salvage - like these original doors from Jaipur palaces. I told you the doors were big! Hmmm, very nice. 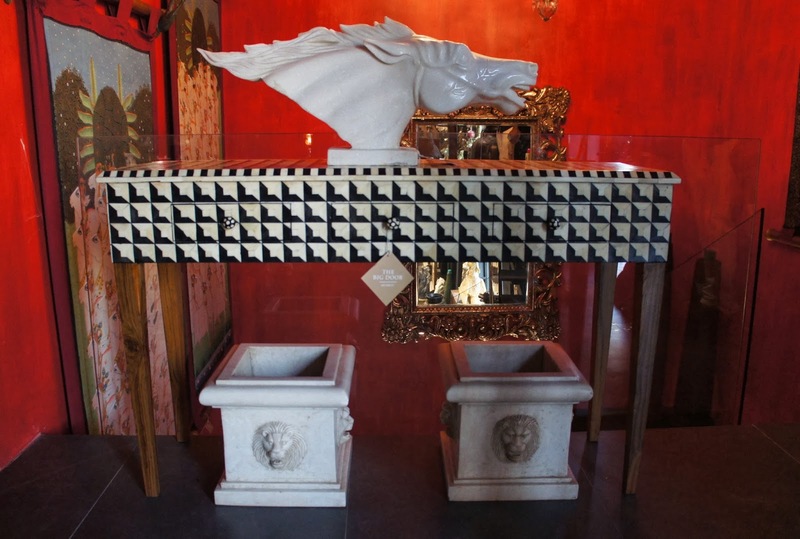 I particularly like the black and white bone inlay console table...it looks great in my living room! 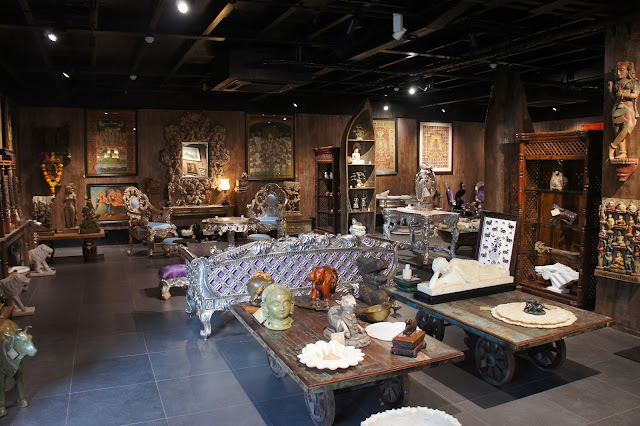 A veritable Aladdin's Cave - loved it. This looks like the perfect place for me to find something 'typically Indian' to take home to remind me of this adventure. Thanks for sharing the info. Welcome Sunil & thanks for commenting! Wow, amazing store. 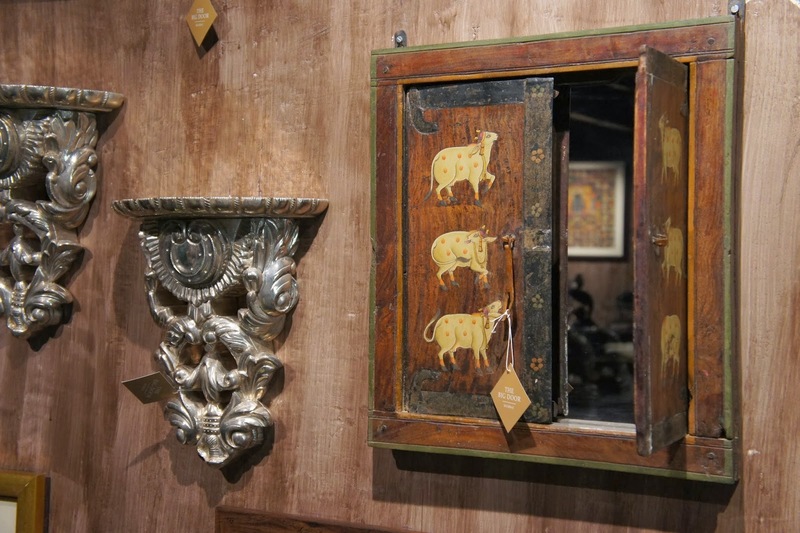 I especially loved the majestic doors, that mirror with the cow illustrations on the doors, and the silver elephants. I have been living in Mumbai for close to 5 years now, and I have recently started following your blog to find the cool places to visit here. Thanks for discovering these places for me and your other readers. And please keep up the good work. Thanks Piyush and welcome to my blog! I just feel like some of this stuff shouldn't be on sale, but in museums. 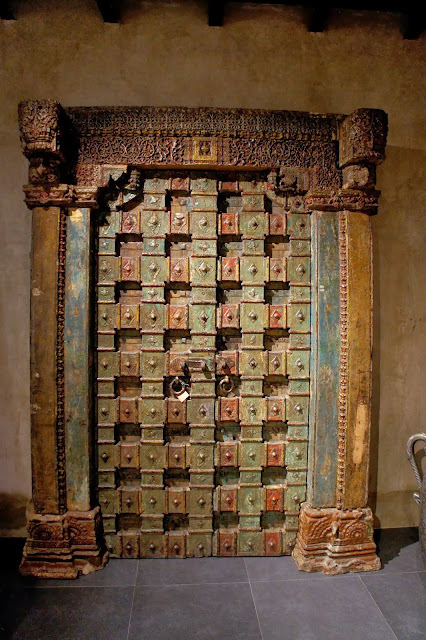 Everyone deserves to look at those doors, and those statues, and learn and get that exposure- not just the rich who can afford to buy them. Hi, thanks for taking the time to comment. 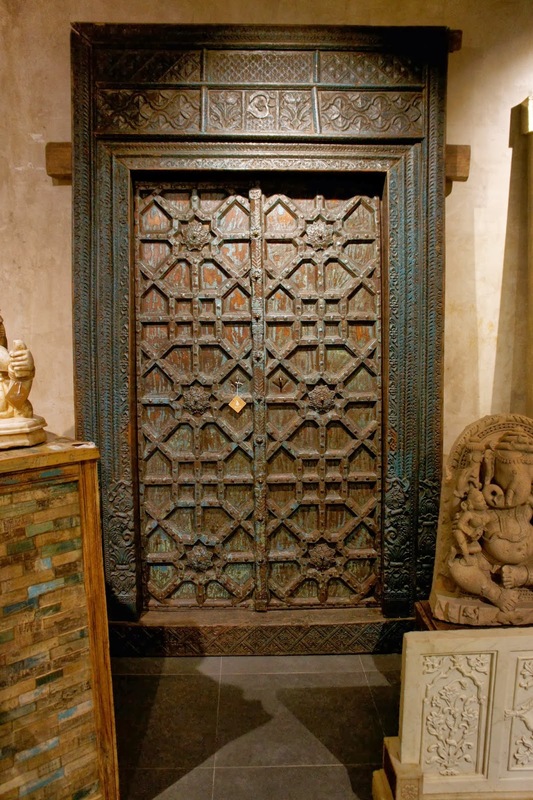 Actually, shops like these are saving architectural pieces - these doors come from old properties in Rajasthan which are being demolished or refurbished! They may alternatively end up on a rubbish heap! It would be great to see a sample of such artefacts in museums but from the museums I've visited, no one has yet thought of it! Hi, this is a wonderful collection...Does Big Door ship items abroad to UK? Hi - I am not sure - you would have to contact them directly to find out. Good luck!